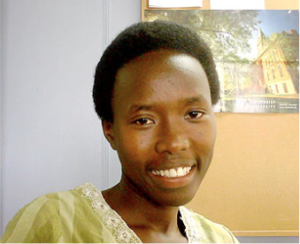 In May, 2011 Rosine Ndayishimiye and 10 schoolmates initiated the first entrepreneurship club at their school, Lycee de Kigali. She launched the club after taking the one week intensive Entrepreneurship and Leadership course run by Dennis. She credits that experience with setting her entrepreneurial mindset in motion. Four months later, she started a business of selling fruits—avocados and bananas. Each member came up with an initial contribution of at least Rwf 2,000 (2,000 Rwandan Francs, or approximately $3.00), and together they managed to raise a total of Rwf 28.000 ($43.00). In the beginning, they sold 16-30 avocados per day. Now the club sells at least 200 avocados daily. That is a profit of Rwf 1 million per year (about $1,500).She notes that the club has since grown from the initial eleven pioneer members to fifty. Thanks to her efforts exhibited through the school entrepreneurship club, Rosine was selected from more than 1,200 applicants to be one of 23 Bridge2Rwanda Scholars. The B2R Scholars Program is a gap year program that helps the best-performing Rwandan students win scholarships in top institutions in the US, Canada and Europe.